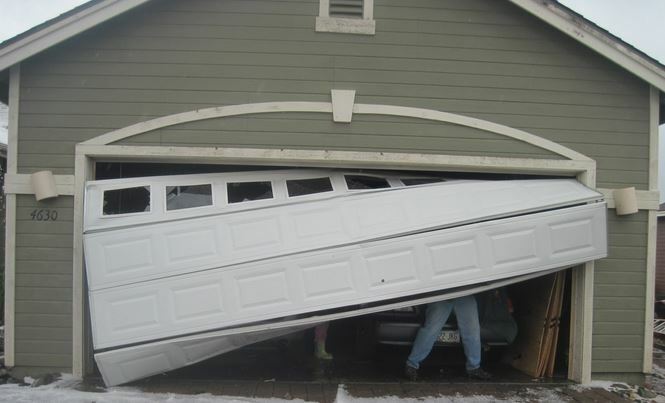 We can QUICKLY replace garage door sections (panels) damaged or broken from an accident, whatever type of door you have: residential, commercial, industrial or agricultural. Can I replace only the damaged section of my door? Whether a bottom section or one in the middle is damaged, we can replace them promptly. No matter what happened, you only have to replace the damaged section without having to replace the whole door. However there is a rule of thumb: if you have 2 or more damaged sections, the replacement cost for these 2 is almost the same as a completely new door. If I replace the broken section, what will happen to the colour of my door? Depending on the age of your door, it’s possible, that by replacing only the damaged section with the original door colour, there will be a colour difference, especially in the sheen of the door. To lessen this effect, you can wax the undamaged sections with car wax in order to give an equal shine to every part of your door. Can I replace the damaged sections myself? YES, if you have good knowledge of the workings of a garage door. However, we don’t recommend it. Often, it is the bottom section of the door that your car hit when you backed out of the garage too fast. This section is connected to your spring (counterweight) system which is under extreme tension. Any mishandling of this section can cause serious injuries. And if I need to replace my whole garage door? Is your garage door so damaged that you need to replace more than a couple sections? Or is it too old for you to be able to get replacement sections? We suggest replacing the door with a new one. To assist you in making an informed choice, we provide you a quotation with up to three alternate prices.